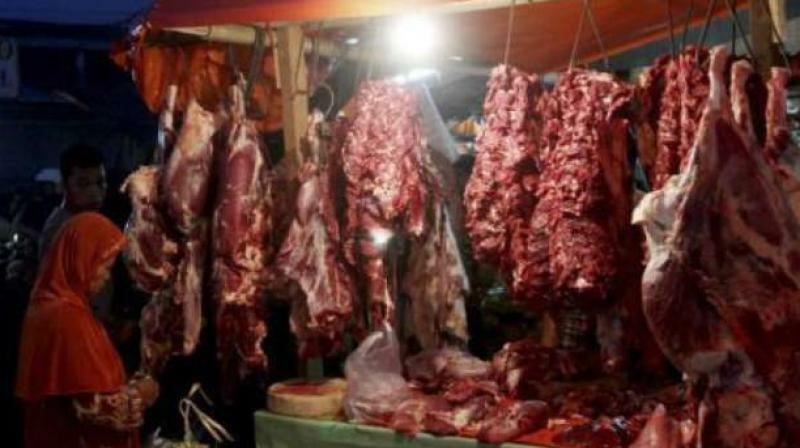 Rajahmundry: Civic authorities have imposed curbs on the sale of meat to ensure that it should be sold under hygienic conditions especially during summer in the city. The civic authorities will send a list of norms to be complied with by the meat sellers at their shops. Accordingly, no mutton seller will be allowed to slaughter animals near the shop and animals like goats are to be taken to the government run slaughter house for slaughter. It should be sealed by a veterinary officer giving indication that the animal before slaughter was healthy and fit for human consumption. Moreover, no meat slaughtered other than at government slaughter house will be permitted for sale and also no stale meat should be sold to the public. The meat sellers were asked to avoid use of banned plastic covers and instead asked to use banana leaves and other leaves like Tamaraakulu and Vistrakulu to pack the meat before selling to the customers. The meat sellers were also asked to keep dustbins at the shops to dump all waste and hand over to the sanitation staff to ensure proper maintenance of sanitation in the area. The meat sellers were also asked to protect the meat by covering it with nets to avoid it from getting infested with flies. Municipal commissioner V. Vijay Kumar Raju directed the civic staff to inspect the meat shops and initiate action if the meat sellers flout norms. Meanwhile, the civic staff already served notices on owners of some meat shops for failing to comply with norms to maintain hygienic atmosphere at shops.